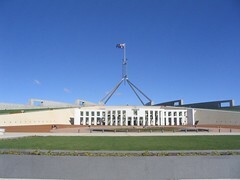 On Friday, I played hooky and went to Canberra with a group tour from the University. In an effort to get picked up at 6:30am from where I live and not from the university (which would be a forty minute walk), I organized six people. It was a fun group. We hopped the bus and then proceeded to the university where the other 100 participants were waiting. The ride to Canberra was about 3 hours, and a very lazy ride since we were all sleepy. I fell asleep and missed a few kangaroo sightings, but woke in time for tea. We stopped about two hours into the journey, and the group leaders pulled out hot water, cups, cookies, tea and instant coffee. It was a nice treat, especially since it was pretty cold (about 9°C / 48°F) where we stopped. We had all been spoiled by the nice weather in Wollongong, which has not yet dipped below 15°C / 60°F. When we left, it was a balmy 20°C / 68°F. We first stopped at Cockington Green Gardens. 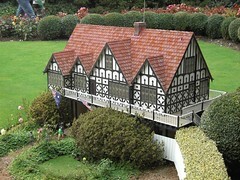 This was a place with little miniature buildings surrounded with gardens. It was quite nice, except for the chilly wind, clouds and occasional rain. Check out the rest of the photos in the set (click the image) to see more photos of the gardens. The building was awesome, and I would like to go back and see the House in session. I hear it's a lot of fun to watch. All I know is that the seats in the meeting rooms are very very comfortable. It's also a museum -- there were many neat artifacts and paintings there. There was a 1297 hand-written copy of the Magna Carta just sitting in a glass case. It was amazing -- there are only four copies like it in the world. Leaving Parliament, I noticed a strange looking colorful building across the lake. I thought perhaps it was a theater or art gallery. When we pulled up at the building ten minutes later, I realized it was the National Museum where we would be having lunch. The building is very cool. 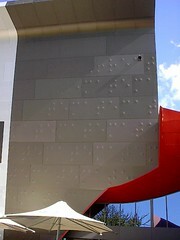 The only thing that confuses me about the building is the braille on the outside of the building. It is HUGE and high-up. I don't think blind people could read it. It's not like normal letters -- when you make it bigger, braille is not readable from a great distance! I am imagining a bunch of blind people crawling on the building's walls reading them. It did look very cool though. We ate lunch there, throwing food to the seagulls, watching them squawk and fight over leftover bread crusts and chips, then had 15 minutes to explore the exhibits. Pathetic. We piled into a rotating theater called Cirque, which gave us a very post-modernist view of the museum. There were three screens, each with submersive video (ambient lights flashing and colored according to the video) and one of the screens had three smaller screens that moved around on it. It was fun. Then we had to leave. I want to go back. Finally, we stopped at Telstra Tower. 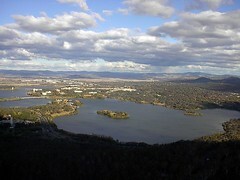 This tower is on a mountain in Canberra, and overlooks the entire city. From there we were able to see the whole city, and climb to a lookout platform 870m above sea-level. It was windy up there! The views were fantastic, and many people enjoyed overpriced iced cream and souvenirs from the shop at the top. The whole time we were there, I was disappointed that we didn't spend more time at the Museum instead. I find that stuff more fascinating, though the view was pretty cool. On our way back, we drove past the War Memorial, which is an awesome sight even as driving past. There are beautiful memorial sculptures for each war, and then a big hall visible from the road, or even from the Parliament House. Yet another thing I want to go back and see. Somehow I have to rationalize going back. The bus ride on the way back was fun. We saw a lot of kangaroos in the fields along side of the road. They behave a lot like deer, except they bounce a lot higher. When it got dark, the French people in the back of the bus started belting out their national anthem (La Marseillaise), then a German guy, then they got me to sing ours. I can't sing well on demand like that, especially a song with a big range, but I did my best. Next we tried to get a Chinese guy to sing his anthem, but he was too quiet. After much discussion, the German guy convinced the bus driver to allow use of the intercom. The next 30 minutes involved singing of many anthems (France, Germany, USA, China, Japan, Colombia, Australia, Indonesia) and attempts at convincing others. We made one stop on the way back for toilets and foreign food (McDonalds). The 100-some people completely filled the restaurant, which to my surprise was able to serve everyone in about 10 minutes. Good job guys. The McDonalds menus here are much better than those in the US -- there are healthy sandwiches on the menu! And a large is only about 20oz, versus the huge tub 'o coke you get in the US. Finally, and the best part, is the McCafé. They serve espresso in McDonalds here. Yum. The trip was good, but I want to go back. Canberra houses the history of the nation and many very interesting sights. Anyone up for a trip?